It was said of Great-Aunt Lizzie that “she went up the back stairs and returned by the front!” Sadly though, she returned "down the back stairs" at the end of her life and was poorer perhaps than when she had started out. Elizabeth Caroline Cope was born on October 28th 1862 in Bedfordbury, Westminster, a narrow lane a little way behind St Martin-in-the-Fields where she was christened on November 16th. She was the second child of Henry George Cope of Lambeth and Sarah Alicia Arrowsmith of Chatham. Henry and Sarah had six children altogether, the eldest, also Henry George (junior) being born in George Court, just off the Strand, but the rest were born in Bedfordbury. At one stage they appear to have moved ‘next door’ but several families occupied every house. The term 'flats' was not yet in use, but presumably there were more rooms available in the one next door. Henry George senior is listed as first a carpenter, then a greengrocer, but he was always involved with something to do with his father’s “eating-house” in Cornwall Road where he grew up. After Lizzie came Francis William Phipps Cope, or Frank, named for his uncle who lived with them in George Court. Then William for his grandfather and Phipps for his grandmother’s maiden name in the old tradition. (He emigrated to Alberta as a young man) The fourth child was Ada Beatrice Cope, like many girls of the time called after the Princess! Next came Thomas and lastly William Samuel. Nothing is known of Lizzie’s early life. She presumably went to one of the nearby National Schools. She had cousins living not far away and one of the girls, Laura Goodson, who was the same age, was a live-in servant at the age of 19 in the household of a Rosa Barnett and her daughter, also called Rosa, who ran a School of Dancing in Belgrave Road, Westminster. At some point in the mid-seventies the family moved to 35 Commercial Road, Lambeth where Lizzie's grandfather, William Cope, had run his coffee shop for well over twenty years. Previously he had "eating-rooms" round the corner in Cornwall Road. According to Ada, her younger sister, William went blind in old age, though this is not noted in the 1881 Census. Probably his eyesight was poor and Ada, then was embarrassed at having to take him to church. She thought she would be labelled as “Little Nell”. Perhaps William was looking for larger premises. He had first a daughter, then a son with their respective families living with him for a while. It may have been at this point that Lizzie moved out, for she was not “at home” in 1881 at the time of the Census when she was eighteen. By the age of 12 or 13 in 1875 she was old enough to go into service. There was very little other work available for girls at that time; to live with relatives as a servant gave them a wider experience before marrying and settling down to run their own homes. Nothing is known at present of how Lizzie began her life “up the back stairs”, only a few tantalising glimpses from family anecdotes. The quest began back about 1950 with a remark by Ada. She was asked what life was like when she was a young girl, and said that her mother took her to tea with Mrs O’Shea. Then Ada added, “That was long before the scandal with Parnell.” This was a complete mystery as the two families hardly moved in the same social circles! The story of ‘Kitty O’Shea’ hit the headlines in the 1890s and undermined the Irish bid for Home Rule for many years. The story is a well-known one and more details can be found in many books and encyclopaedias. She was never 'Kitty' but 'Kate' and was not Irish though it suited the press to imply that she was. Katherine Page Wood, born 1846, was the 13th child and 6th daughter of Sir John Page Wood of Rivenhall Place, Essex, at one time chaplain in the royal household. Katherine was known as Katie to the family, never Kitty, which was a newspaper invention, nor was she Irish or Catholic. She married firstly William Henry O’Shea whose father was a Catholic solicitor in Dublin. He became a cornet of the 18th Hussars and retired as a Captain. Willie gambled and spent money recklessly. He had to sell his string of racehorses and their estate near Stevenage and then they were constantly on the move. In 1871 the family were bankrupt and lived for a time in Brighton. However Mrs O’Shea’s brother-in-law bailed them out and for a while they returned to their busy social life which included entertaining on a rather lavish scale. During this period of the early seventies the O'Sheas moved four times in four years. They had three children, Gerard, (or Gaynor as he appears on the 1881 Census), born in Brighton, Norah and Carmen. They were for a few years in Beaufort Gardens, Chelsea, but had to move to a smaller house on the Harrow Road as they became increasingly insolvent, and then Hastings. They often stayed with Lady Emma, Katie’s mother at Rivenhall or visited Emma or Anna, Katie’s sisters and particularly her aunt Maria, wife of Benjamin Wood, and known as “Aunt Ben”, on whom they became rather dependent financially. Maria Wood was wealthy and rather eccentric, but childless. She did not approve of Willie but was very fond of Katie, treating her in many ways like a daughter. She often rescued them from disaster and it is said that she urged Katie several times to leave her worthless husband. For a while Katie O’Shea made daily visits to her Aunt Ben at Eltham Park where she had leased a large house, (Crown property) every day. Though Willie did continue to visit this was the beginning of their separation, especially as he continued to involve himself in other wild business ventures, sometimes abroad. If Lizzie Cope was "personal maid" at this time there are certain inconsistencies between the two "accounts". The early 1870s can be ruled out. Katie O’Shea’s personal maid, a French girl called Caroline, who had been with her from the beginning, remained loyal when they sold Bennington Park and the racehorses and was still with her in Chelsea. Moreover Lizzie would still have been at school! Ada said that “Mrs O’Sheas two little boys played the piano.” Her memory could have been faulty here as Mrs O’Shea had only the one boy, Gerard. Boys at that time were not ‘breeched’ – put into trousers – until the age of four or five but were dressed just like their sisters. Assuming that a child might start learning the piano at the age of four – enough to play a very simple little piece – it could be that Ada simply mistook Norah for a boy. The visit could then be dated to 1877 or 1878 as Norah was born in January 1873. Ada’s mother, Sarah Alecia Cope, née Arrowsmith, died of pneumonia on Oct. 18th 1878 after being ill for two months so the summer of 1878 is the last possible date for this event. At that time Lizzie was 15, Ada 10, Gerard 8, and Norah 5. The O’Shea family were already installed at North Park, Eltham which would be fairly easy to reach by train from Waterloo. The coffee shop was only a short step from Waterloo Station. However, Lizzie would be rather young to be a ‘lady’s maid’. A few years later, in 1881at North Park, another girl, Mary Frances, aged 28, is recorded on the Census as Katie’s personal maid. It is just possible that Lizzie fitted in between these other two. She was with Mrs O’Shea at Seaford and “paraded in furs” along the Promenade, so that was presumably in winter! There is another possibility which would put the visit much later - and still "well before the scandal." There is no firm record of Lizzie on the 1881 Census, only a girl of the right age, Elizabeth M. Cope in service in St Helier, Jersey. The initial 'M' is wrong, possibly no more than a simple mistake, a nd if this is still Lizzie, it could explain the 'folk memory' passed down by more than one branch of the family that there was a connection with the Channel Islands. No other possible evidence of such a 'connection' has been found. It was in 1880 when Willie O'Shea was elected as an Irish member for County Clare that Katie met Charles Stuart Parnell. She had been instrumental in furthering her husband's parliamentary career which naturally brought her into close contact with the Irish party in the Commons. Parnell, born in 1846 in Co.Wicklow in Ireland, led the struggle for Irish Home Rule. He had been an MP since 1875. Soon he was showing himself a master of disguise as he followed Katie around the places she stayed in Brighton and elsewhere. He even visited her often at Eltham from 1881 onwards. There is some doubt about whether Willie knew of their ‘arrangements’. It is possible that he may have found them ‘convenient’. Captain O’Shea, as he liked to be known, helped Parnell in his campaign for the leadership of the Irish National Party. Their association continued through the eighties. Katie was heavily involved as intermediary between Gladstone and Parnell but relations between her husband and her lover were increasingly strained. In the 1880s she had three more daughters, the first of whom died in infancy. They were all christened with the O’Shea surname though they were undoubtedly Parnell’s children. Ada claimed that the ‘tea’ incident was “long before the scandal”. This could simply mean that it wasn’t ‘headline news' – yet! If it took place in the eighties rather than the seventies the ‘mother’ referred to could have been Ada’s stepmother. Her father, Henry George Cope (senior) had married his second wife, Sophia, in early 1879, though he himself died on January 28th 1881 after being ill for two months with pneumonia. Sophia survived him for many years. Ada continued to live at home until at least the summer of 1889 when she herself was married. Katie’s affair was not known to the public until the nineties. As Gerard O’Shea was ten in 1880 he was sent away to school, and hardly fits the description of 'small boy'. (As he grew up he was increasingly sympathetic towards his father and rather hostile towards his mother.) The scandal became public knowledge at last after the death of Maria Wood who died in 1889, leaving her considerable property to her niece. Captain O’Shea, seeing that he was to get none of it, filed for divorce with Parnell as co-respondent and this was granted without being contested, in November 1890. Parnell married Katie O’Shea on 26th June 1891 in Brighton. It was there, at their house in Walsingham Terrace that he died four months later, from pneumonia. Katie Parnell as she now was, died on April 22nd, 1905 at Littlehampton. Elizabeth married Edward (Ted) Knight, and he was still alive in 1914, but no records have yet been found of the marriage or of his death nor of Lizzie's baby who died at the age of about 8 months. 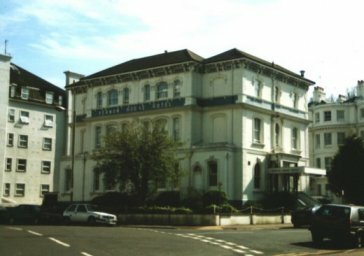 The Knights ran a hotel, Vernon House, in Hartington Place in Eastbourne the history of which can be traced in the local Trade Directories. Betty describes her Great-Aunt Lizzie as “an extremely intimidating lady. I was scared stiff of her!” Perhaps the loss of the baby was why Lizzie so often had her young nieces to stay. Edie, daughter of Ada, 'lived' there for several months and her younger sister Ethel said "Lizzie almost adopted her." Edie's cousin, Lily Cope, daughter of Henry George Cope, was another frequent visitor and during WW1 she worked there as a maid. The young girls were sometimes treated very much as servants rather than guests and could be spoken too quite sharply on occasion! Lizzie used to collect her guests from the station with a carriage and pair – and two Dalmatians trotting behind! Among the guests were "the Belgian ambassador, the Duke and Duchess of Devonshire, Cecil Rhodes, Admiral (Earl) Jellicoe and Mme Dreyfuss who gave Edie half a crown." The hotel was sold about 1930 or so. Lizzie became a companion to a titled lady – and rather dependent on her. She was living with her niece Alice when she died a few years later in Wickham Lane, Plumstead with only £12 5s 11d to her name. This is very near to Eltham Park where Katie O’Shea lived.